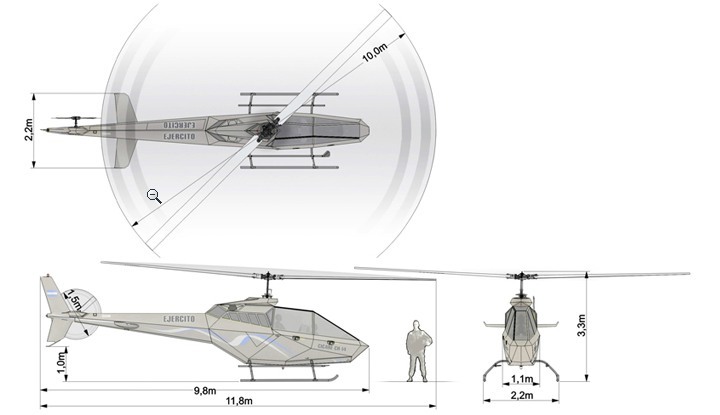 Description The CH-14 is a two seater, light helicopter in a tandem configuration. The project was started after the Argentine Army Aviation requested the development of a light attack and reconnaissance helicopter in 2005. In 2007, a prototype was shown to the public on Army Aviation Day. The design is based on the Bell 206 JetRanger. One of the most striking features of the CH-14 Aguilucho (Little Eagle) is its macho appearance. The development was conducted according to FAR-27 regulations. The development program is still in the (experimental) project phase. Only one prototype has been built. The CH-14 is a two seater, light helicopter in a tandem configuration. The project was started after the Argentine Army Aviation requested the development of a light attack and reconnaissance helicopter in 2005. In 2007, a prototype was shown to the public on Army Aviation Day. Can you tell me what is the units for each quantity? for example is the unit of TailRotor Diameter in meter or foot or something else? Units are default Imperial (miles, foots, etc). You can select SI system (meter, km, etc) with the dropdown listbox at the top of the page.. I changed the helicopter model page so that the unit is always displayed. Do you want to comment the Cicare CH-14 Aguilucho helicopter?